Anti-Modi Posters Emerge in Lucknow, Modi to Face Advani-like Fate? The posters said, “Yogi lao, desh bachao' (Bring Yogi to save the country)”, and compared PM Modi to the CM. After Bharatiya Janata Party (BJP) faced humiliating defeat in the five states in assembly elections, a controversial poster popped up in an upscale area in Lucknow on Wednesday, demanding Uttar Pradesh CM Yogi Adityanath be made India’s next prime minister. The poster also slams PM Narendra Modi for jumlebaji (fake promises). The poster was reportedly put up by a little-known “fringe” outfit named Uttar Pradesh Navnirman Sena (UPNNS). The posters said, “Yogi lao, desh bachao' (Bring Yogi to save the country)”, and compared PM Modi to the CM. The poster also carried the hashtag #Yogi4PM. The man behind the poster, one Amit Jani, who is the chief of UPNNS, slammed PM Modi, while praising the CM for pushing the agenda of Hindutva. He said that the religious congregation in February will declare that Hindus will not vote for the BJP if Yogi was not made the prime ministerial candidate. Jani has also released a video, which is being shared widely on social media, in which, he is accusing Modi of failing to deliver on the promises to Hindus, and not paying enough attention to the Ram Temple and cow protection issues. He further said that Modi will be voted out by the Hindus if he doesn’t rectify his mistakes. Another poster put up in the area compares Modi’s “work” with Yogi’s. The comparison says that while Modi has hurt the sentiments of savarna (upper caste) and pichhda (backward class), Adityanath is committed to the cause of Hindu Rashtra and Ram Mandir. Modi is blamed for withdrawing the lawsuit again Kashmir’s stone-pelters, while the UP CM was praised for taking strict action against cow slaughterers, and protection to gau rakshaks. An FIR has been registered at Hazratganj police station against UPNNS for defaming Prime Minister. The UP Police have removed the posters as well. BJP state spokesperson Shalabh Mani Tripathi told Newsclick that it was some fringe group that has put up the posters, and police will nab them soon. “There is no conflict in the party,” he claimed. 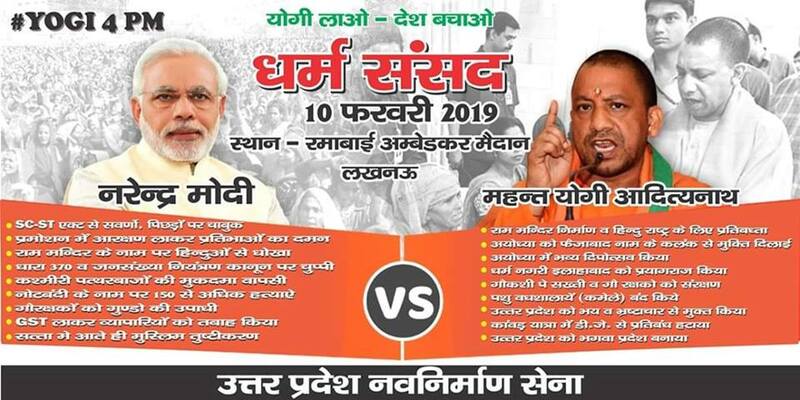 Interestingly, the posters have emerged hours after BJP suffered defeat in three Northern states – Rajasthan, Madhya Pradesh and Chhattisgarh, where Adityanath too had actively campaigned, pushing the Hindutva agenda.